The Oregon Legislature has decided to use the short session to ramrod monumental environmental mandates which will likely impact every single business and home in Oregon. 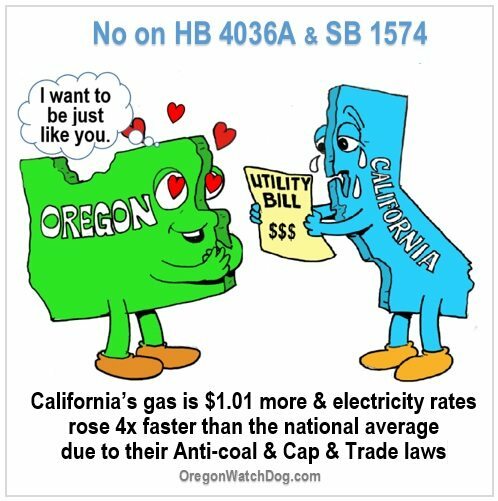 One bill is SB 1574 which deals with the heavy handed Cap-and-Trade system. This is often considered a hidden sales tax on energy. California already has a cap and Trade program and it cost businesses $1 billion in carbon penalties. The other bill is HB 4036A which blocks Oregonians from choosing their own electricity if it comes from coal. This bill has made headlines because Governor Kate Brown tried to censor Oregon’s Public Utility Commissioners from being involved in the bill. The Public Utility Commissioners complained that the bill would come at a high cost. They also said the bill (in its original form) would do nothing to help reduce greenhouse gases. California which has anti-coal mandates and a Cap-and-Trade system is already a nationwide example of how regulation overkill hurts the poor and middle class. These rules have contributed to California’s gas being $1.14 higher than national rates and electricity rates being four times higher. You can follow Senate Bill 1574 here. The bills are being debated and changed quickly during the Session.